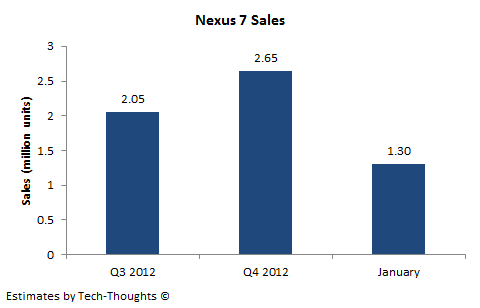 About a month after its launch, I had estimated the Nexus 7's sales volume for Q3 and Q4, using supply chain data. Thanks to comments from Asustek's CFO and inputs from IDC and Digitimes, we may finally have enough data to grade that estimate. At the beginning, it was, for instance, 500K units a month, then maybe 600, 700K. This latest month, it was close to 1 million. 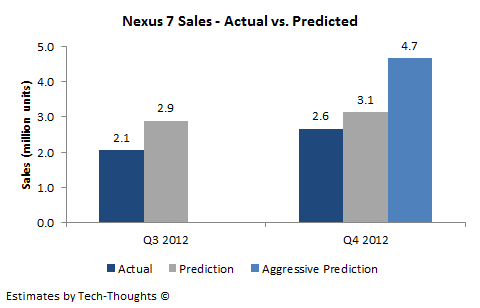 Based on these comments and the implied ramp-up of sales, Nexus 7 sales have totaled about 2.05 million in Q3 2012. According to IDC, Asus' tablet shipments totaled 2.4 million in Q3, of which 85% were Nexus 7s. Asus' tablet shipments totaled 3.1 million in Q4, which implies 2.65 million Nexus 7 units (using the same proportion from Q3, i.e. 85%). This also means that non-Nexus 7 shipments grew from 0.35 million in Q3 to 0.45 million in Q4, which looks quite realistic. Digitmes also reported that 6 million Nexus 7 units had been shipped at the end of January, which pegs shipments at 1.3 million for the month. This boost is most likely the result of expanding distribution. As the chart above shows, actual sales seem to be below my estimates. In Q3, my estimate was purely based on production data, cycle time and sell-through rate. Based on the actual sales data, my cycle time seems to have been roughly accurate, but either production yield rates were lower than expected or sell-through rates were lower than predicted. Since the Nexus 7 did not suffer from continuous sell-outs, it is safe to say that my sell-through rate input was the primary culprit. I had assumed a high-sell through rate in August (may have been a silly assumption based on early stock-outs), which remained roughly flat through the quarter. In actuality, early sell-through rate was relatively low (stock-outs possibly being a function of lower early yields) and this rate kept began ramping up through increased product awareness and distribution (again, quite obvious in hindsight). The low-end of my Q4 estimate was much closer to actual sales, as sell-through rates had reached levels close to the assumed input in my estimate. However, since the key bottleneck was sell-through rate, the aggressive estimate (through increased production) never materialized. However, selling 4.7 million units in two quarters is still quite impressive given the relatively low distribution for the product. Even more impressive is the fact that Google's Nexus 7 strategy showed OEMs how to compete with the iPad. This strategy has proved so effective that Android tablets actually overtook the iPad's market share in Q4. With HP entering the Android tablet fray, it looks like Microsoft's partners are beginning to take notice as well.